Conrad Hawkins (MATT CZUCHRY) is one of Chastain Park Memorial Hospital’s best doctors. Charming and arrogant, Conrad likes to take an unconventional approach whenever possible and believes it’s his personal duty to shatter the romantic illusions of the first-year residents. Dr. Devon Pravesh (MANISH DAYAL) is an innocent idealist who leans on his finely tuned moral compass, but with Conrad’s help, he begins to realize that the practice of medicine is a business, like any other, with less-than-angelic patients and fallible doctors. This three-disc set was released through Fox’s MOD program and thus have plain white discs and no bonus material. Rather basic, but the only way to get this show on physical format at a relatively decent price. The Resident is presented in its original 16×9 enhanced 1.78 widescreen aspect ratio and looks pretty good for standard definition and colors are generally bright. Each episode comes with a standard but effective, albeit strong at times, Dolby Digital 5.1 track. 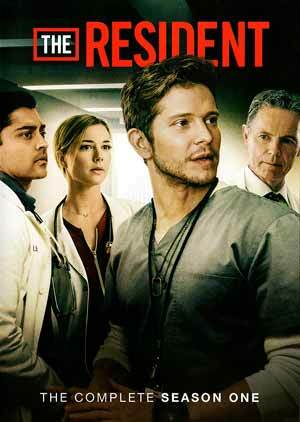 Overall, The Resident: The Complete Season One is a perfectly serviceable medical drama but as someone who isn’t the biggest fan of that genre of television, I wasn’t entirely invested in the soap opera-like plots and characters, though the acting isn’t half bad and never a bad thing having someone like Bruce Green being part of your ensemble, especially portraying a deliciously flawed surgeon.